We can’t just have evergreens. Deciduous leaves have an entirely different structure than those of evergreen conifers, adding to the diversity and fertility of the forest floor. As deciduous trees generally thrive in nutritious soils, they are able to generate a whole lot of foliage all at once. Therefore, they photosynthesize (convert carbon dioxide and sunlight into oxygen and glucose) at a more intensive rate than evergreens, which have adapted to the nutrient-poor soils of our area by continually growing and shedding smaller needle-like leaves throughout the year. Evergreen leaves photosynthesize at a slower rate, are much less palatable to hungry insects, and tolerate inclement weather, but they don’t always return a lot of nutrition back to the soil. That’s where deciduous leaves come in. 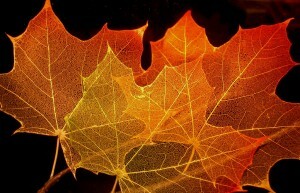 The process of shedding leaves is called abscission. When the cool weather sets in and sunlight wanes, the tree releases series of hormones that construct a cell barrier at the base of the leaf petiole—the stem where the leaf meets the tree branch—and block off any remaining glucose from traveling from the leaf to the tree. In cool temperatures, the glucose turns various shades of red. Any yellow color comes from an absence of chlorophyll in the leaf, while brown hues mean its skeletal structure is showing through. Leaves Are Good for the Garden! When these leaves fall to the ground, they are anything but a mess! Rather, they bring wondrous benefits to our home ecosystem. Here are the ways your leaves nurture your garden. All-Natural Fertilizer: Leaves are rich in carbon, trace amounts of glucose, and other nutrients that slowly feed our plants as they decompose. Cheap and Cozy Mulch: Piled at the base of our plants, or over tender tubers, leaves regulate soil temperature during the frosts of winter and help maintain even soil moisture. They can even keep weeds down when you spread them in open areas! Soil Microbe Multivitamins: Leaves give our soil microbes, fungi, and nematodes plenty to eat during the cool winter months, resulting in the plant fertilizer mentioned above. Insect Habitat: Leaf litter—especially when piled high—is a warm, dry, and food-rich habitat for spiders, butterfly larvae, ladybugs, and countless other beneficial insects that need a place to hibernate until spring. Bird Buffet: Speaking of insect habitat… leaf litter is an excellent place for overwintering bird populations to forage for a winter snack! So stow the leaf blower and rake up these carboniferous all-stars off your lawn and low-growing plants to store them in wheelbarrows or paper yard waste bags for year-round use in your yard. Compost: Mix leaves with grass clippings at a 1:3 ratio to get spectacular yard waste compost! Worm Bins: Keep some leaves to mix into your worm bin when it gets smelly or overly wet. Red wigglers love leaf litter! Mulch: Cover open areas, such as flower beds, vegetable gardens, or just plain empty soil, with a thick blanket of leaves to control cool-weather weeds. Pet Habitats: Drop a few leaves into a pet gecko, frog, or even shrimp habitat to replicate an outdoor habitat inside. Be sure to rinse leaves once or twice with warm water and them let them dry to remove any insects, feces, or other residue. Of course, if a deciduous tree or shrub is ailing from anthracnose or another contagious disease, if is best to collect those leaves and place them directly in the curbside yard waste bin. Cedar Grove’s complex composting system is able to heat debris to a high temperature we can’t reach in home composting, which effectively kills most diseases. 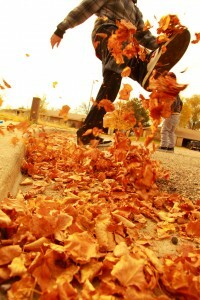 So, enjoy this year’s crop of leaves, for their color, their abundance and their life giving properties!